Hello, I am back after a long vacation. It has been such a long time since I blogged and I have truly missed it. My vacation seemed to have lasted forever, India after Germany and when I got back, I dived right into daily routine. Well, vacation season in UAE is over, and it is back to business for everyone. And I am really glad to get back to blogging. Pork is not made often in our house, but when it is made, it is eaten with a lot of enthusiasm and cleaned out in no time. 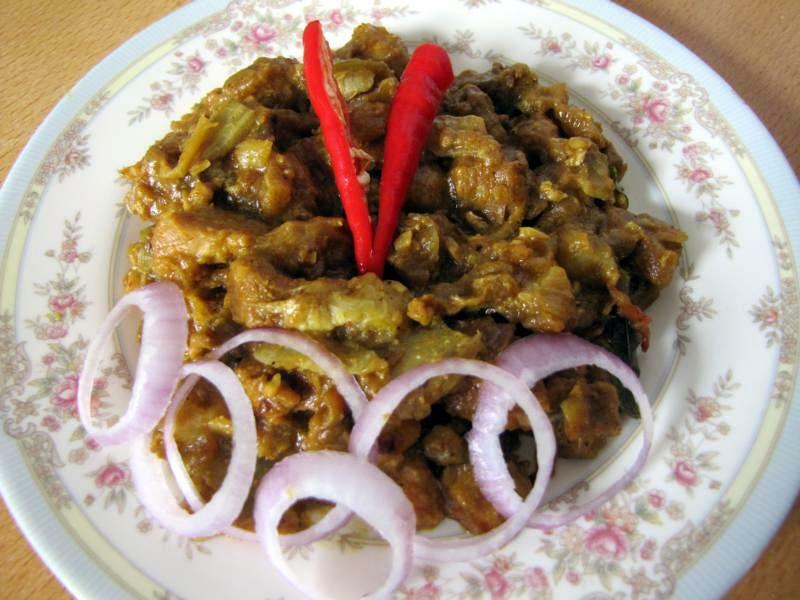 I never used to eat pork in India due to a bad experience when I was a child. My love for this meat started when I was tricked into eating it by a family friend in Dubai. I thought that the spicy preparation was beef, and only after I had chowed down the food, did they disclose the secret! This is my version of that same dish that I ate at my friends place all those years ago. 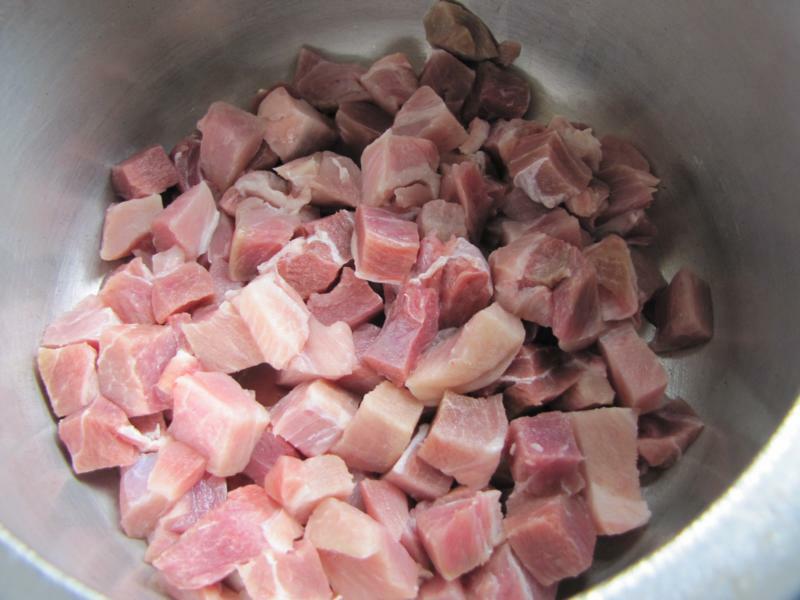 I have used boneless cubes of pork here, however this recipe is tastier when the meat is with bones and has more fat. Onions, ginger, garlic, Red Chili, and curry leaves. Pressure cook the pork with the above and some spice powders. Add a little vinegar…the slightly tangy taste goes well with pork. 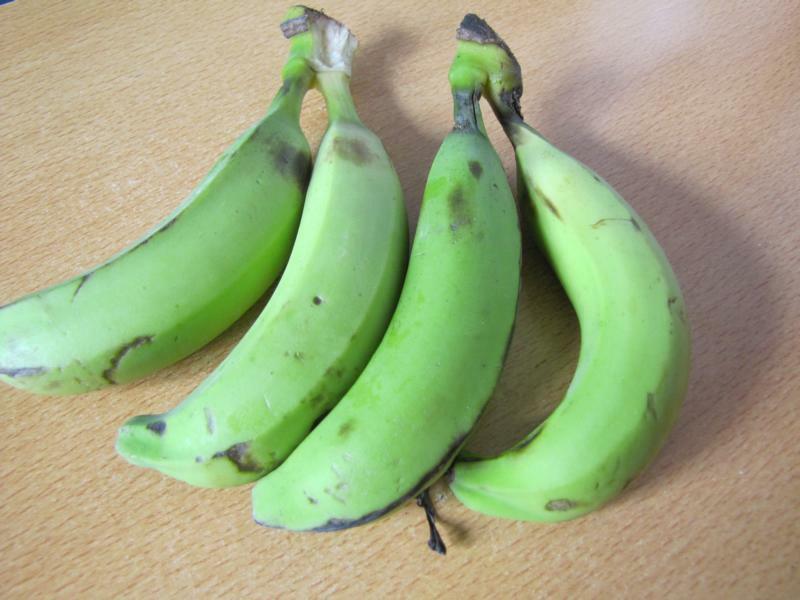 An interesting ingredient in this recipe is raw banana. Also peeled, cubed and pressure cooked with a little salt and turmeric until soft…. Ensure that it does not overcook and get mushy. 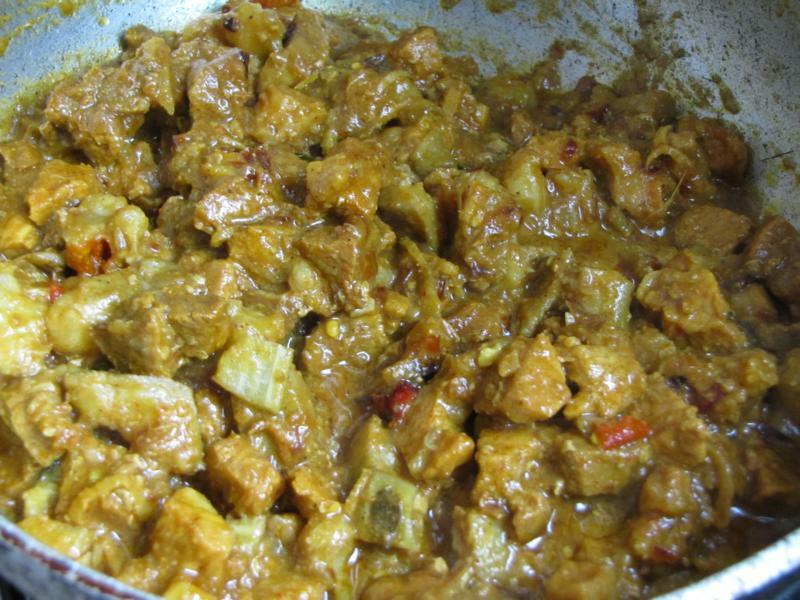 Once the pork and the banana are cooked, get started on the spicy mixture. 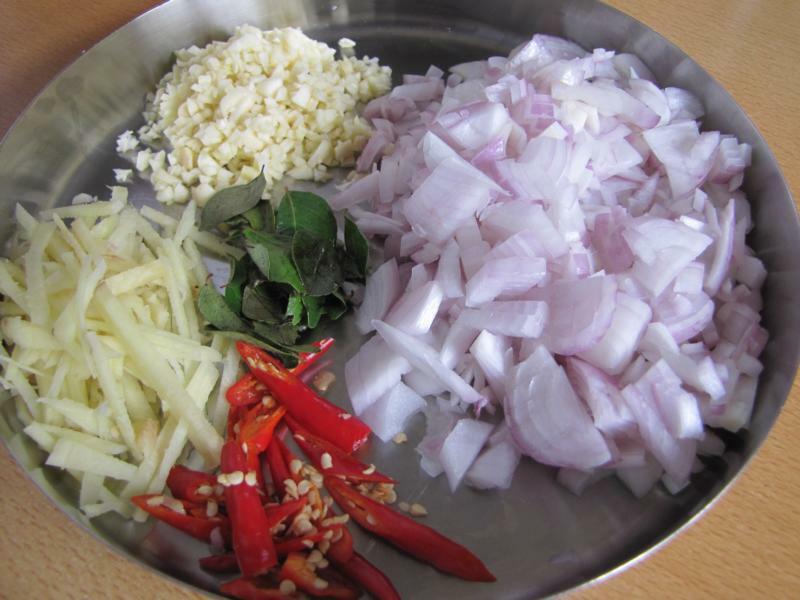 Sauté some more onions, ginger, garlic, red chlli and curry leaves in coconut or vegetable oil. Once soft, add garam masala ad black pepper powder. Fry for a few minutes. 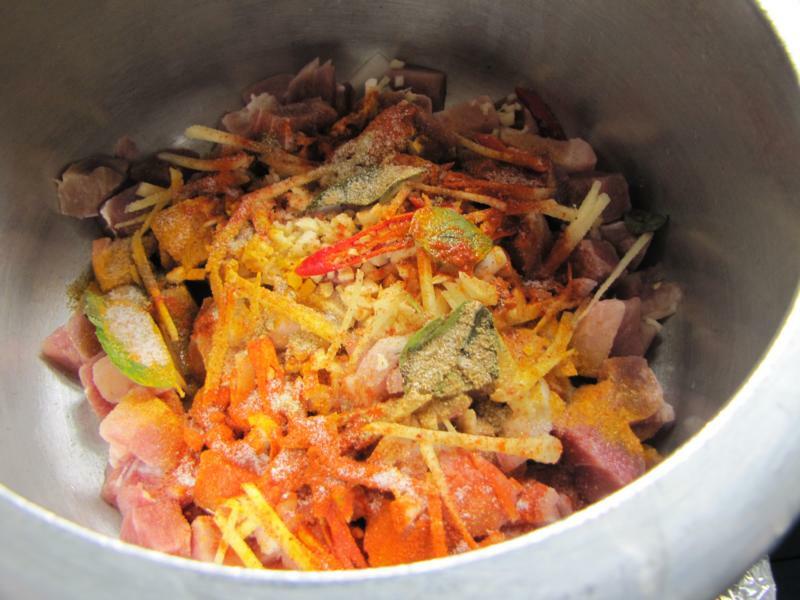 Add the cooked pork and mix well.. let it fry for 2 – 3 minutes. Finally add the raw bananas. And mix well. It doesn’t need to be cooked for a long time, as pork and the banana are pre-cooked. 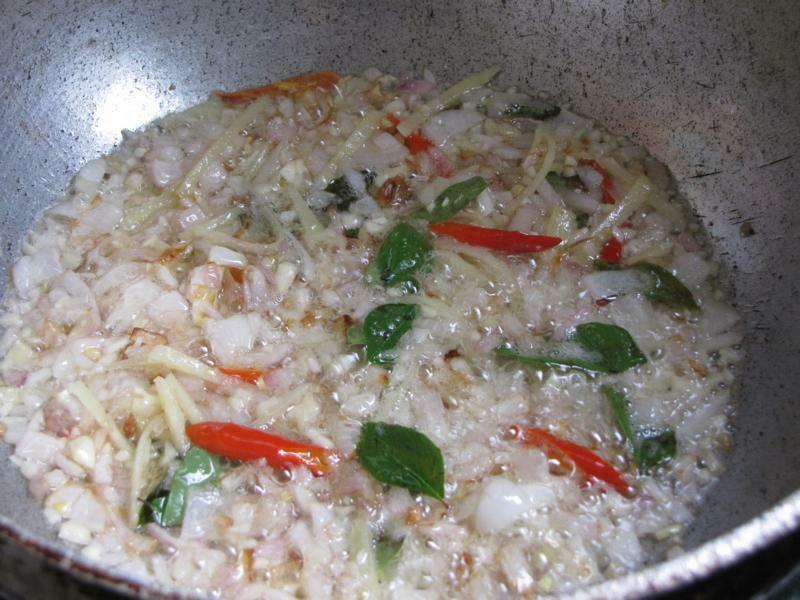 Heat oil in a pan, add the onions and sauté for two minutes and then add the ginger, garlic, red chilli and curry leaves. Fry for few minutes and then add the garam masala and black pepper powder and fry for 2-3 mins. Now add the pork and mix well. Finally add the cooked banana to this and mix well. Take it off the heat. Garnish with coriander leaves and onion rings. Serve hot with chapati or Kerala porotta.